Javorek Logging, Inc. is a Wisconsin based logging company. We are a cut-to-length operation focused on providing customer satisfaction and quality woodland improvement on both private and public lands. Our company also provides contract logging services for industry. Javorek Logging, Inc. is committed to responsible environmental management. 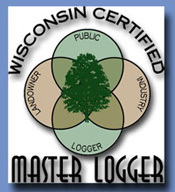 Our operators are all SFI trained and we have Wisconsin Master Logger status. We can help you make quality decisions on the management and harvesting of your woodlands. Our experienced operators will capture the greatest value for your timber using technologically advanced, efficient and environmentally friendly equipment. We can provide forestry assistance or recommend private or industrial foresters who will meet your specific woodland needs.